then topped with cheesy polenta and tons more grated cheese. It makes a great freezer meal because you can prep the veggies and polenta, layer it in a pan, and then bake it whenever you want. All the ingredients hold up well from the stove top to the freezer to the oven, and it is extremely versatile: though we eat it alone, it would make a great accompaniment for grilled chicken or fish. Normally, when I make this, I’ll make one for us to eat that night and then stick a second in the freezer. Because of the swap, I doubled my usual “recipe” (I say that loosely because until now I never actually had a recipe for this), and made four tins. Thus, the following recipe will make four casseroles in the 9 3/8″ x 9 3/8″ x 2 3/8″ foil “poultry pans,” each of which should serve approximately 4-6 people as a main dish (more as a side). If you don’t want that much, you can easily divide the recipe by 4 to get just one pan-full. P.S. — This is a super cheap meal, which is why we frequently ate it during our SNAP challenge. I bought all of the ingredients for this for a little under $30, which makes each meal less than $7.50 or about $1.25/serving. Begin by preparing the vegetables. If using dried beans, it can be helpful to soak them overnight, though not necessary; cover with lots of water, bring to a boil, then simmer for 45 minutes to an hour, or until the beans are tender. 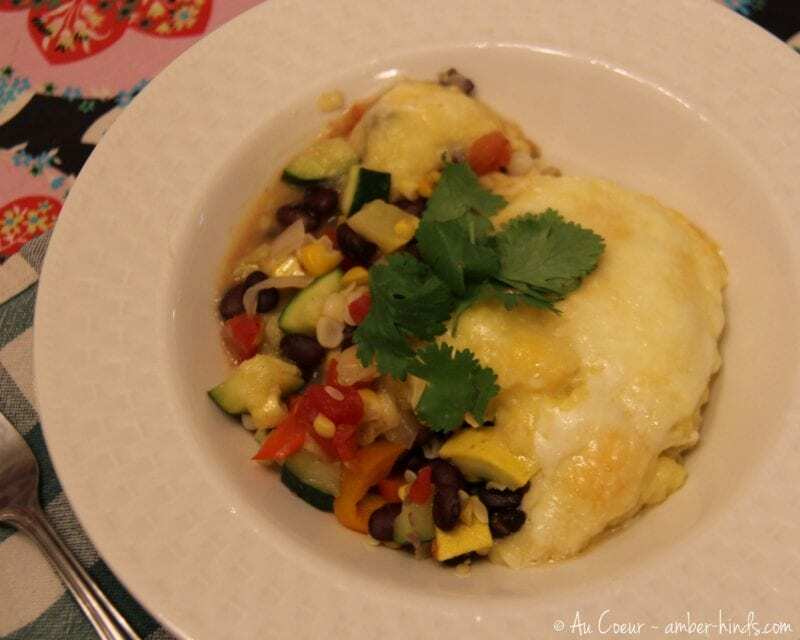 To avoid timing issues, ensure beans are fully cooked before beginning the rest of the meal. If using canned beans, rinse and set aside. 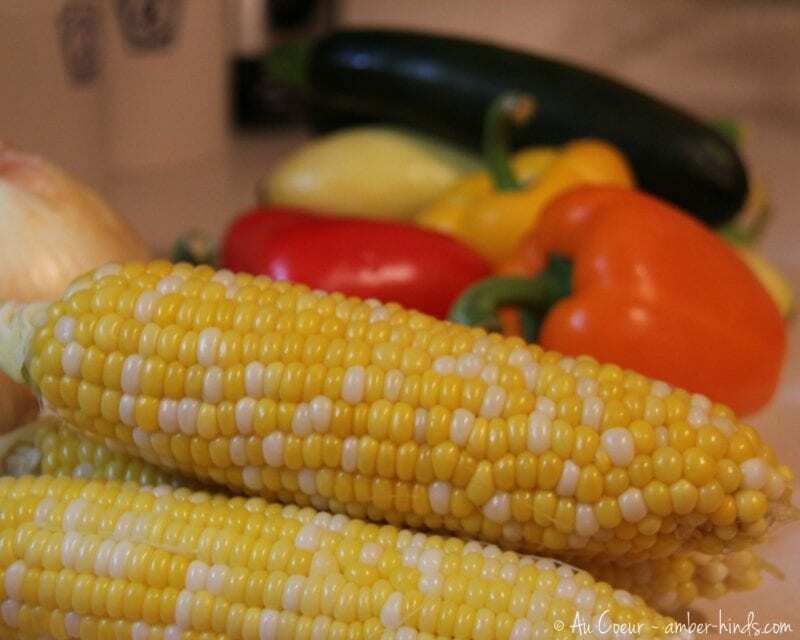 For corn, bring a large pot of water to boil, shuck corn then add to boiling water and cook for 2-3 minutes. Turn off heat and leave ears in the water. Wash(peel) and dice the onion, bell peppers, zucchini, and summer squash. Heat a large skillet over medium low heat. When pan is hot, add one tablespoon of olive oil and the diced onions. Stir onions to evenly coat in the oil, then cover so they can “sweat” and sweeten. Cook, covered but stirring frequently, until soft and transparent. Put cooked onions in a large mixing bowl. Repeat steps to cook bell peppers and squashes one after another. Add 2 tablespoons water with the tablespoon of olive oil when cooking the zucchini and summer squash; since this will be baked in the oven, take care not to overcook squash or it will turn into mush. 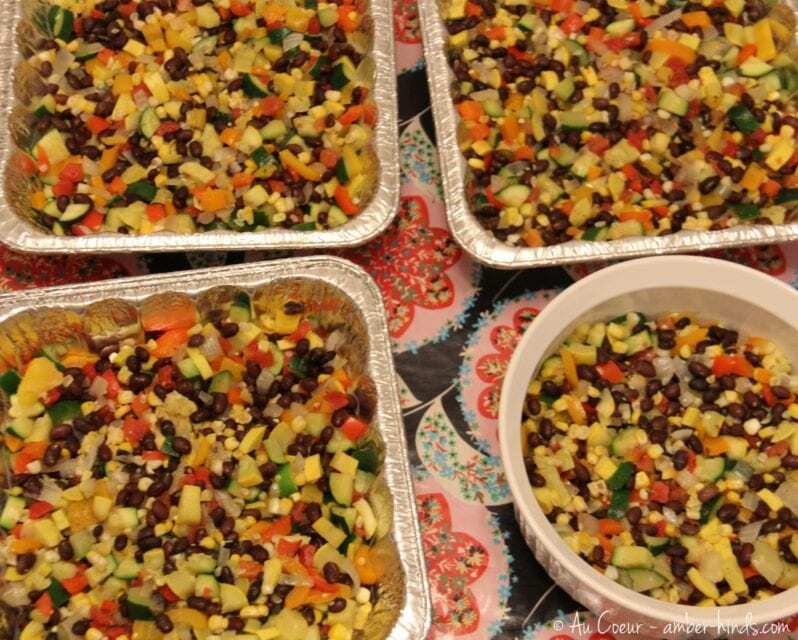 When onion, bell peppers, zucchini, and summer squash have been cooked and added to the mixing bowl, cut corn kernels from the cobs and add to the mixing bowl with the black beans, Rotel, and cumin. Stir to evenly mix, then salt and pepper to taste. For the polenta, heat 12 cups of water in a heavy-bottomed pan over high heat. While water is coming to a boil, grate or shred cheese and distribute vegetable mixture evenly between the four tins. When water reaches a full rolling boil, reduce heat to medium-high; stir in salt, then whisk in the cornmeal. Stir continuously to avoid lumps until mixture is thickened and bubbly. Remove pot from heat and stir in half of the shredded cheese. Quickly pour polenta over the vegetables and use a rubber spatula to spread the mixture to the edges of the tins. Top each casserole with the remaining cheese. To bake immediately, preheat oven to 425F and bake uncovered until casserole is bubbly and cheese is browned. 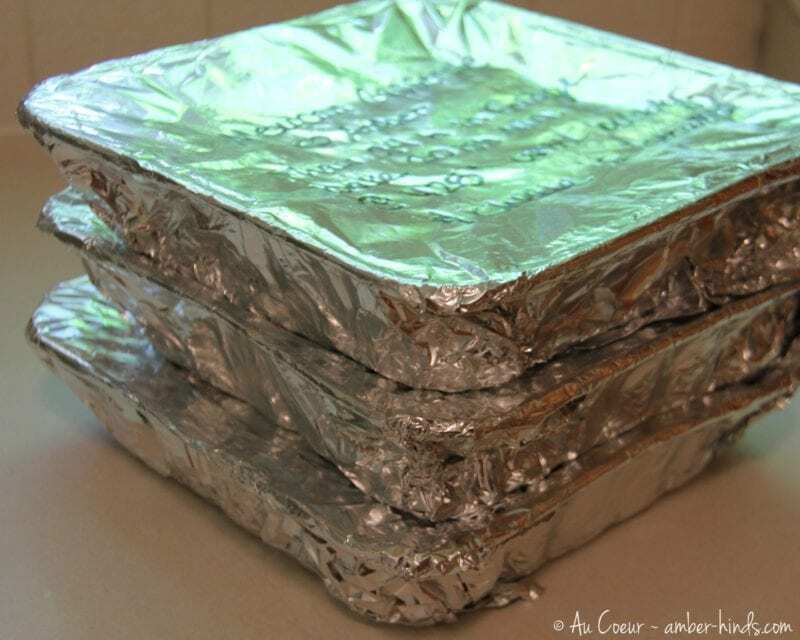 To freeze, wrap with a triple layer of tinfoil and label with the name of the dish, date, and cooking instructions. This is best eaten within 3 months of preparation. To cook frozen casserole, first thaw 24 hours or overnight in the refrigerator. Bake at 425F uncovered until casserole is bubbly and cheese is browned (approximately 20 minutes if completely thawed; longer if still partially frozen). Optional garnishes might include fresh cilantro, sour cream, and/or salsa. Goes well with chicken or fish.